Oregon QB Vernon Adams will attend Seattle's rookie mini-camp next weekend on a tryout basis, a league source has confirmed to the Seattle Times, after going unselected in this weekend's NFL Draft. 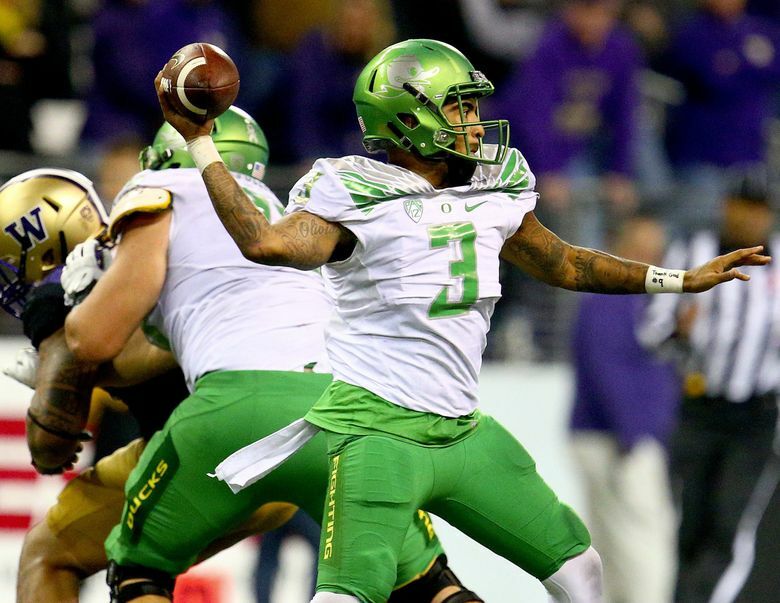 Former Oregon quarterback Vernon Adams will attend the Seahawks’ rookie mini-camp May 6-8 on a tryout basis, a league source confirmed to the Seattle Times. Adams did not get selected in the NFL draft and did not sign as an undrafted free agent. The news of Adams’ tryout with Seattle was first reported by the NFL Network. Seattle also has signed former TCU quarterback Trevone Boykin, who confirmed his signing on Twitter, as well as his agent. The Seahawks and other teams often end up signing players who take part in rookie mini-camps on a tryout basis. Teams can invite dozens of players on a tryout basis to join with their drafted players and those they have signed as undrafted rookie free agents to participate in the rookie mini-camp. Adams put up monster numbers at Eastern Washington before graduating and transferring to Oregon for one final season in 2015, where he led the nation in yards per attempt (10.2) and pass efficiency (179) while throwing for 26 touchdowns against six interceptions. But his height — just a hair under 5-11 — was regarded as a major stumbling block as well as the fact he played in spread offenses unlike what he would have to operate in the NFL. His height has drawn constant comparisons to Seattle QB Russell Wilson, and it now appears as if Adams will get a chance to compete for a spot on the roster to try to back up Wilson. At the NFL Combine in February, Adams talked about the comparisons he has heard to Wilson and also noted that he has worked with Wilson at some summer football camps. Seattle entered the weekend with just one QB on the roster in Wilson.